Turning obligation on its head. I realize it’s January and most people are busy crushing their New Year’s resolutions, but I’m still stuck on Christmas here. 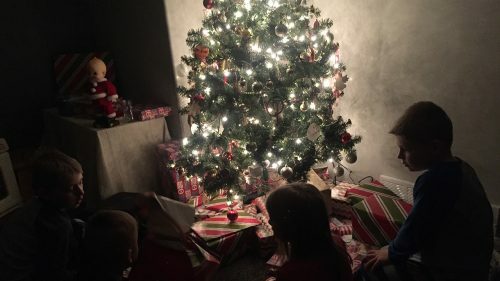 This Christmas was different and I can’t stop thinking about it. Christmas usually gets me all wound up tight. While I want to be relaxed and carefree, delighting in simple joys and the wonder of the advent season, I am usually a ball of stress bouncing from one self-imposed obligation to the next. I have to be a fun mom and fill our advent calendar with creative activities. I have to bake a huge variety of Christmas goodies. I have to have a magazine worthy tree. I have to go to a million and one get-togethers. All the have-to’s get to be a real drain on the spirit. I’m not talking about the Christmas Spirit – that magical feeling that visibly sparkles in the crisp winter air as you and your perfect family sing holiday songs in perfect harmony. I’m talking about the spirit that was set free from the condemnation of guilt and shame by the Saviour of the world. That spirit of the free woman who, when believing the “I have to” refrain, lives as though she were captive to the law of her own making. All those compounding “I have to” statements made me pretty Grinchy. Which actually wasn’t pretty. I didn’t want to listen to Christmas music before December 1. I didn’t want to put up decorations before December 1. I basically didn’t want to think about Christmas until December. I didn’t want to go to all the family gatherings. And I wanted every trace of Christmas put away before January came. This past Christmas was different. I was eagerly buying gifts for my husband and kids. I was delighting in finding them things I knew they’d love, and I was doing it in November. I had ideas about what gifts would bless people and I had time and warm weather to make it happen: shopping was enjoyable rather than a chore. Things quickly snowballed out of control. One of my favourite artists released a Christmas album on American Thanksgiving: as if I was going to wait until December to listen! A respected author was hosting a webinar about having a peaceful and joyful Christmas, and it was at the end of November. Piano lessons were conflicting with our usual December 1 tree decorating festivities so we were either going to have to postpone, or do it in late November (which we did). By God’s grace, all of my “I have to” obligations turned into “I get to” delights. I get to lavish the people I love with generosity. I get to bake delicious things. I get to surprise my kids with fun things to do. I get to listen to music that celebrates the miracle of God become flesh. I get to feast my eyes on a sparse old plastic tree that was lovingly decorated by little hands. I get to gather with family and eat meal after meal of blessing. Rather than being weighed down by the stress from self-imposed obligations, I finally realized, these are things I get to do because I’m free. I’m free from condemnation; free from guilt and shame over not getting things perfect. I’m free to celebrate, rejoice, and relax. I’m free to look at the manger holding a holy infant King, and rest in the knowledge that he grew up to do all the God given have-to’s that I’m incapable to doing. I’m free to look at that Saviour and praise him for all I now get to do because He’s made me free.